Patrolling doesn’t just happen during the day and when you need warning lights, you need them more than directly in front. StreetSmart utilizes Whelen high-intensity, wide-angle, ultra-bright Super-LED lights positioned for 360° visibility to give you the most reliable and effective warning system available. Siren? We have that too! And all StreetSmart components are powered off rechargeable 12v batteries so you aren’t changing out AAs every few shifts. With the optional wireless remote control, you can engage the lights or siren even if you step away from your Patroller. For a Front Driving Light, we added a Whelen® ultra bright high intensity white Super-LED wide angle light designed for heavy-duty performance and mounted it on a swivel bracket for adjustability. Our light-weight and compact black Siren is a single tone, 110 decibel original. We created it with a volume control so you can crank it up for those loud events, or turn it down when you’re inside. The StreetSmart Soft Side Cargo Bag is water resistant with an adjustable inside divider, outside zippered pockets, and unlike the hard cases, it works with the Patroller! It even has an inside sleeve for your zip-tie hand cuffs. Finish off the other side with another Soft Bag or our Cargo Plate Cover. Our black powder-coated 12 gauge steel Police Light Bars utilize Whelen SmartLED® heavy-duty lights. With white front driving lights and flashing red tail lights, you’re safer in the dark. When you turn on your warning lights, each side lights up with 4 alternating high intensity, wide angle Super-LEDs in red and blue flashing lights giving you true 360° visibility. To make things even easier, StreetSmart has created an extremely compact Remote Control System for managing all the lights and siren from a single controller mounted on the handle bar or attached to a key fob. The encrypted wireless signal gives you superior security while the long range transmitter allows you to engage the lights or siren even if you step away from your Segway. Segway noticed a trend in public safety – especially in Europe – with the increasing use of optic yellow to provide greater visibility of the rider. 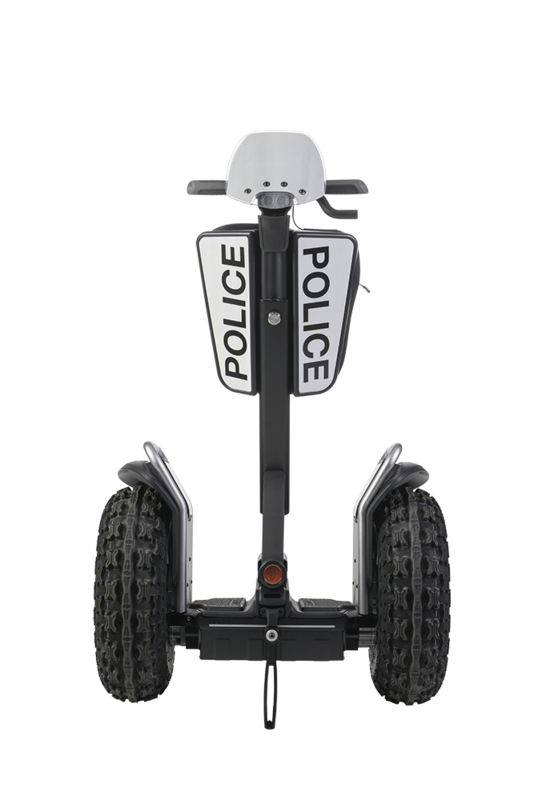 It is appearing in apparel, as decals on vehicles, and now it comes standard on the Segway Patroller. If it doesn’t jibe with your organization, there’s also white; both of which are made from 3M™ DiamondGrade™ reflective material. That’s the same high-grade stuff you see on street signs and vehicle edging. Shine a light at it and it shines right back at you with nearly blinding intensity. You can choose black reflective identification lettering for police in multiple languages or security in English. Just below the top shield and above the center of the handlebar is a window that allows the integrated strobe lights to shine through. Choose between flashing red and blue or amber and white. Each Segway PT uses patented dynamic stabilization technology that has been proven in the marketplace as a superior solution in crowded or tight venues. It empowers riders with unparalleled maneuverability (true zero turning radius) and a unique user interface that is so fluid Segway simply calls it LeanSteer™ technology. Think about where you’ll be riding your Segway Patroller. 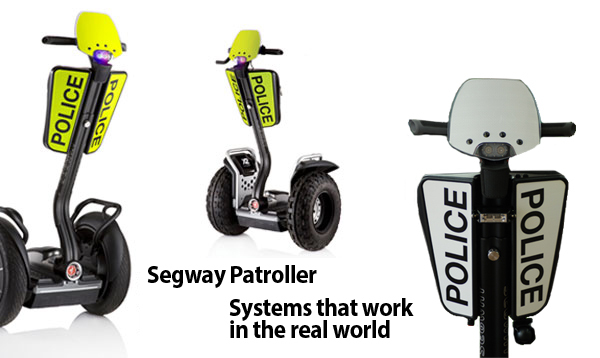 If it’s mostly indoor or over smooth terrain, consider the Segway Patroller i2 model. Its smaller, non-marking tires help to maximize range; getting you up to 24 miles on a single charge. With a footprint of 19″x25″ it easily fits through a standard doorway. If it’s more rugged terrain you’ll be traveling over outdoors, the x2 may be a better option for your organization. Its deeply treaded tires help carry you over dirt and loose gravel while providing for a comfortable ride. And if you’re lucky enough to be patrolling on a beach with soft sand, this tire can handle it.